PSYCHLOPS (Psychological Outcome Profiles) is a short, one page mental health outcome measure that can be used during the course of any psychotherapeutic intervention. It promotes a patient-centred definition of therapy outcome, is patient-generated and can be self-completed. It’s not intended as a diagnostic instrument, but instead is put forward as a highly sensitive measure of change during the course of psychotherapeutic interventions. It captures data before, during and after a course of therapy. Change can be measured throughout the process of therapy, whether or not therapy is completed. 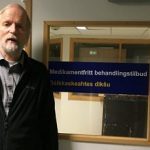 ” … the only client-generated mental health questionnaire that can be self-completed without the input of a therapist and which focuses the measurement of outcomes on problems and consequences of most importance to the client. PSYCHLOPS started out as a somewhat niche instrument which tried to capture the client’s voice directly, at a time when the use of metrics in mental health was becoming ever-present and arguably required an antidote. Instead of administering a battery of usually well-constructed but sometimes not very relevant questions, PSYCHLOPS simply asks about the problem which is worrying the client most of all. The client writes their problem in a free-text box and rates the extent to which it troubles them. 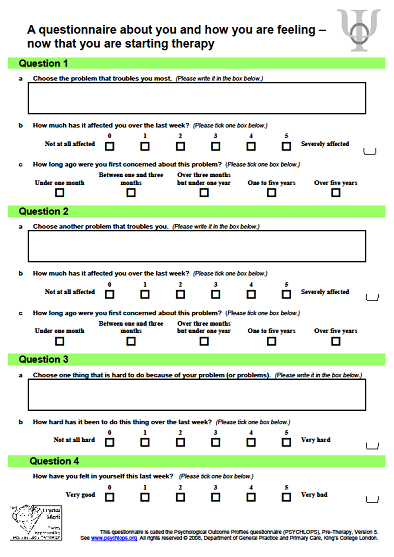 The questionnaire also contains short questions about functional impairment and wellbeing. 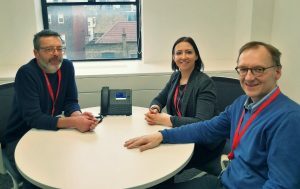 The PSYCHLOPS development team [right to left in picture: Dr. Mark Ashworth, Dr. Maria Kordowicz and Dr. Peter Schofield], based at King’s College London, has carried out research which strongly suggests that standardised instruments commonly used in the NHS can fail to capture the real experience of being mentally unwell, as well as recovery. If you look at the descriptions given by clients using PSYCHLOPS, over half report an issue or item which simply doesn’t appear on the usual measures (1). Therefore, why not let clients define their own experience rather than capturing this purely through the limited lens of population-based metrics? Yet, the PSYCHLOPS development team favours a pluralist approach to measuring the outcome of talking therapy. Standardised measures are vital for diagnosis and establishing population norms. But capturing recovery (‘responsiveness to change’) is much more likely if you focus on personalised definitions of recovery. Interestingly, the 10-year NHS Plan was launched earlier this week (7th January 2019) and it has a focus on ‘personalised medicine’. The use of the PSYCHLOPS tool can make a small but significant contribution to shifting the focus to personalised mental health care. Further, PSYCHLOPS is free to access and use. Recently, PSYCHLOPS has been used by several international organisations because of its cultural neutrality. WHO [World Health Organisation] use it in their PM+ programme (2), offering mental health interventions in conflict zones. A new version of PSYCHLOPS for kids has also been launched (3).